EXACTLY HOW DEGENERATIVE disc disease is treated depends on a great number of factors. These include the pain the patient experiences, the distribution of the pain, any sensory problems (numbness or tingling), and functional changes (limping, bladder control, decreased reflexes, etc). In addition, treatment may depend on the timeframes in which these symptoms have occurred, the duration and intensity of the symptoms, and more. Your doctor should carefully consider both the qualitative and the quantitative situation then put this information into context with diagnostic results from X-ray studies, MRIs, etc. The initial treatment for suspected degenerative disc disease is usually conservative in nature. The term “conservative” in medical spheres is usually synonymous with non-invasive or non-surgical measures. Conservative steps such as physical therapy and pain medication are often prescribed to allow the body a chance to heal itself or at least let the symptoms resolve or decrease as much as possible. Other conservative measures can include ultrasound, restricted activities, heat and/or ice, stretching, and more. Conservative care can allow the symptoms of degenerative disc disease to be alleviated without actually removing the cause of the difficulties. Conservative steps can also allow weakened back muscles, often the source of back pain, to be strengthened. While patients sometimes chafe at being told repeatedly that rest, exercises, and pain medication are the best method of treatment, the truth is that many back injuries and spine problems can be cured or alleviated with these measures. There are also a significant number of back injuries that simply resolve by themselves over time. d ineffective. Thorough conservative therapy usually means at least six months of consistent pain management through medication and physical therapy. 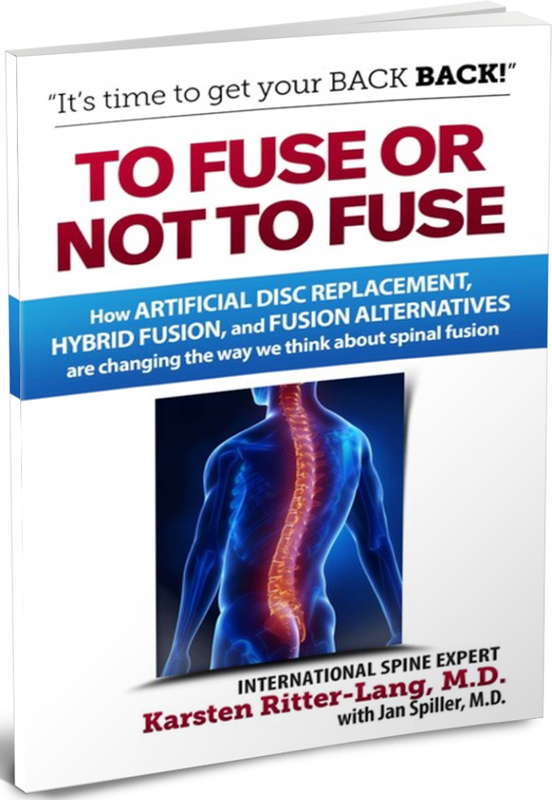 While you will read later in this book about the extremely positive outcomes we have had with disc replacement, even this very successful procedure should be performed only if conservative care has been exhausted first. Surgery has risks associated with it, and you should not undergo such risks unless you absolutely need to. If the structure of the spine has become too damaged to respond to non-surgical measures, other, more-invasive steps need to be considered. If a patient demonstrates chronic pain, poor spinal function, and compromised quality of life, we must consider surgical options. There are several types of surgeries that can be used for patients with degenerative disc disease. While spinal fusion is by far the most common spine procedure performed in the U.S., and perhaps in Canada as well, it is only one of many options. Which one is right for you depends on your diagnosis along with many other factors. Discectomy: Many spinal procedures involve partial or full discectomy (also called discotomy), where a portion or all of the disc is removed. This is often employed when a part of the disc has torn off or has been pushed against the nerve root or spinal canal. Other procedures may involve removal of bony fingers or spurs that can develop on the vertebrae and/or widening of the spinal call when it has been compromised. The unfortunate part about most of these procedures is they are temporary fixes to a long-term problem. Removing the bone spurs does not remove the cause of these spurs; over time, the spurs are likely to develop again. Removing all or part of a disc does not repair that disc or restore the proper function of the disc. These procedures simply remove some of the sources of spinal pain but leave the spine prone to recurring problems. In fact, in my experience, roughly half of the patients who received such symptomatic procedures return for surgical intervention at the same level within 10 years. Several medical studies show this alarming statistic as well. This is not good. Laminectomy or Laminotomy: One way to treat the narrowing of the spinal canal is to remove a portion of the vertebra called the lamina. This opens of the space for the nerve roots and spinal cord, removing pressure from impacted structures. The lamina is reduced in small portions using specialized tools until the proper size is reached. Spinal Fusion: Fusion involves physically restraining the motion of the degenerated disc through a variety of methods and approaches. Regardless of the approach, fusion usually requires the surgeon to remove the degenerated disc, install a cage, and then pack the caged disc space with appropriate filling material. This material may come from the patient (from a separate surgical site-often the iliac crest) or from cadaver bone. Other graft materials, including some derived from coral, are used at times. Once the graft material is in place, the surrounding vertebrae are connected with rods and screws. The hardware must then hold the vertebrae rigidly in place long enough for the graft material to fuse to the vertebrae. This can take six to nine months or more. The hardware is usually left in place permanently. We call fusion a “nonfunctional” solution because it removes the normal function of the disc (motion and shock absorption) and replaces this with rigidity. In fusing the vertebrae together, the proper disc space can be restored and pressure removed from nerve roots and the spinal cord. For this reason, this solution can be quite effective. It can restore a certain quality of life by removing pain and other symptoms. It is also very permanent. Once fused, barring some severe accident or disease, the vertebrae will always be fused. Unfortunately, this also means that the lack of motion and shock absorption associated with a healthy joint are also permanently removed. Fusion has become the preferred procedure for spinal surgeons across North America. In fact, fusion has become so prevalent that 87% of spine surgeries performed in the U.S. in 2013 involved fusion (Lee, 2014). This is an astounding statistic, especially since fusion used to be the surgery of last resort. Now, for many surgeons, a recommendation for fusion seems almost automatic. Unfortunately, fusion, while common, is not without side effects. First and foremost is motion loss in the fused portion of the spine. The combination of spinal fusion hardware and the fused vertebrae themselves leaves this portion of the spine, by design, devoid of any motion in any plane. Where the healthy joint moves in six different ways, the fused joint is completely rigid. This loss of motion causes its own set of problems and has created an entirely new disease, Adjacent Segment Disease. spine causes challenges at adjacent levels. When we fuse two or more vertebrae together, we leave the surrounding portions of the spine to “take up the slack” in providing the motion and shock absorption functions of the spine. The additional stresses placed on adjacent discs and vertebrae can cause increased disc degeneration at those levels. This has become so common now that it has been given the name Adjacent Segment Disease and encompasses a number of complications and problems that arise in the areas of the spine immediately above and below the site of a spinal fusion. In my experience, approximately 15% of patients who have spinal fusion require surgical intervention at adjacent levels within the following 10 years. One recent study has found that 22% of patients with lumbar fusions require surgery at adjacent levels within the next 10 years (Sears, et al., 2011). For many patients, a greater than 20% chance of another back surgery within 10 years is unsatisfactory. You really need to get the Spinal Fusion Book to learn more about this! !